The weather is certainly getting cooler outside, and now we bade summer adieu. But, the cooking season is just beginning. I think fall is the perfect season to get back into the kitchen and make good use of that almost forgotten oven. 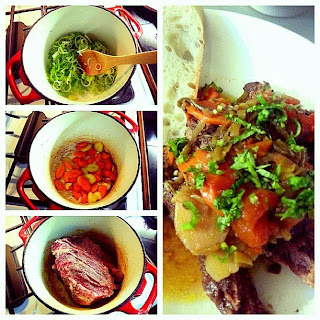 It is also a perfect season for hearty dishes, such as pot roast. So, pick up a nice piece of boneless beef chuck roast, some bright and crisp carrots, leaks, herbs, and a bottle of nice red wine. Three hours and you got yourself a delicious meal, perfect for a cool fall night. While the oven is preheating, generously salt and pepper the chuck roast. [If you can, use kosher salt when cooking. Kosher salt, with its coarse texture, allows for easy pinching when cooking, and the uniform flakes better adhere to meat.] Set aside. If needed, add some more oil to the pan, then sear the chuck roast until browned all over. Remove it from the pan and set aside. Deglaze the pan with some wine, and then put the seared roast back in the pan. Add in the leaks, carrots, tomato, rosemary, thyme, and bay leaf. Add the remaining wine and beef stock. Cover the pan and roast for 3 hours in a 275F oven. Don’t peek! But, once the wait is over, you’ll have the most delicious and tender meat. You can slice it, or simply shred it with a couple of forks and enjoy. Serve along some mashed potatoes or nice crusty bread to dip into those pan juices. You get the idea. Try it. Eat it. Love it. Thanks Sarah! :) I hope you try it and enjoy it!